In Cusmin, you can apply different sets of customizations to different sets of users. A set of such Cusmin settings we simply call a Cusmin Configuration. In Configuration Management section, you can manage Cusmin configurations and apply them to sets of users. Currently selected configuration will appear in this field. In many cases where you have just one set of customizations, you can use a Default configuration, no need to change anything else here. If you want to apply different customizations, for example, one set of customizations to Administrators, and another to Editors, you will need two sets of Cusmin configurations. Click on "New configuration button to create a new Cusmin configuration. You will see a form where you can provide a new configuration name. You can choose any name, but we recommend to have something that will be self-explanatory like "Subscribers", "Editors Customizations", "Login Page", "Advanced customizations" or something similar. If you want to export/import Cusmin settings, you will probably want to check this option. In Cusmin, it's not really possible to export/import Cusmin settings in a standard way, but with this option, it's even easier to do that. In a couple of clicks, you can copy settings from one Cusmin configuration into another. If you use Cusmin across multiple different sites, and you want to copy Cusmin settings from one site to another, this option will be very useful to you. You can even use it on the same site, in case you have multiple configurations, and you want to load settings from an existing configuration to a new configuration, instead of setting up everything manually from the beginning. you will be able to easily find your configuration. Note: Please make sure that your target configuration is already selected. In this example, target configuration is Default configuration. Once you click on Load button. Once you click on Load button, all settings from Editors configuration on example.com will be loaded to your currently selected Default configuration. No changes will be applied to example.com configuration, it will be used just as a source. You can even create a Cusmin configuration that will be used only as a template, for copying settings to other configurations. Important: If you already have set any setting in your currently selected configuration, all of them will be overwritten by the new loaded settings. 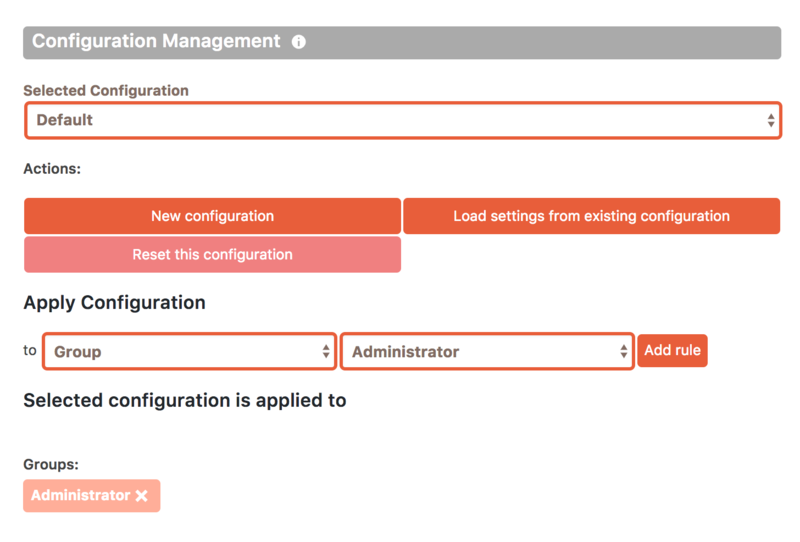 When you load a configuration to your currently selected configuration, you can start making additional changes to it. This will not affect the configuration that is used to load settings from (the source configuration). You can use this action whenever you want. This option will wipe all settings in your currently selected configuration. A confirmation popup will show up where you need to confirm that you really want to do that, so in case you click on this button by mistake, your settings will not be wiped, unless you confirm this action in a popup confirmation box. This option is useful in cases when you want to start customizing this particular Cusmin configuration from the very beginning. This option will delete currently selected configuration completely on the site, will all its settings and customizations. This is useful if you want to reorganize your configurations, start creating new configurations or if you reached the limit of the allowed number of the configurations on your site. The Default configuration cannot be removed since it's used as a starting point for customizing. This option will rename currently selected configuration on the site. You will need to choose a set of users that will be affected by the Cusmin configuration. You can choose to apply it to WordPress groups like Editors, Subscribers, to users that have specific capabilities like Edit posts, Read, Delete pages etc or even to particular users. Note: Since you are WordPress administrator, it's usually useful to apply the configuration that you're currently working on to Administrator Group, or your WordPress user so you can test the settings while configuring. Once you're satisfied with the results, you can just change your set of users to Subscribers or Editors etc.